? ?Aren't these children's beds just dreamy? Here are ten FUNtastic bunk and loft beds we found on Pinterest. Aren't these children's beds just dreamy? 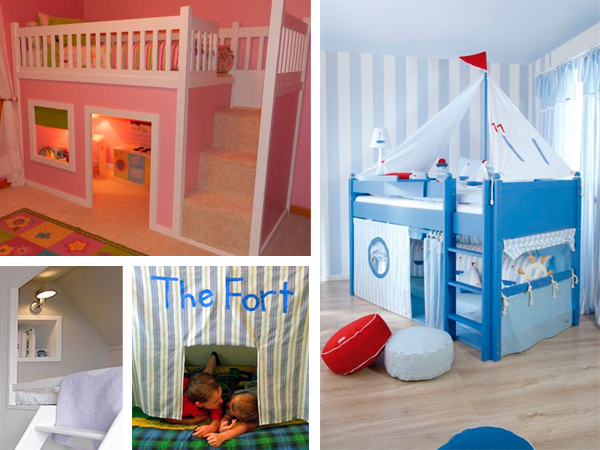 Here are ten FUNtastic bunk and loft beds we found on Pinterest. I’d love to be a child again just so I could have one of the creative bunks or loft beds featured here. There’s only one problem, though: by the time I figured out which one I liked best I’d be all grown up again! Having one of these would take care of two of my childhood yearnings in one: a loft bed and a treehouse. And the one on the left adds a chandelier to the mix to make a hat trick of fabulous ideas. The owner of this pink creation is one spoilt kid. I bet she has hours of fun playing housy-housy or perhaps chilling with her books or tablet. Loft beds are a clever idea for a small room as the sleeping area is conveniently out of the way. If you already have a bunk bed, turn the bottom bunk into a dollhouse with custom-made curtains like those on the right. It’s a less expensive option – and easy to take down when your kid outgrows playing with dolls. Also love the storage bags tied to the top railing. The fabric hanging attached to the top bunk on the left has lots of delightful activities built in. Fruit, vegetables and flowers can be “picked” from the garden and the tree trunk has a hole that lets kids climb into the “club house”, aka the bottom bunk. The fabric fort on the right for older kids is less of a challenge to make and your kids can help with the decorations. If you have a budding actor or music star in the home, a set of stage curtains attached to a loft bed will provide the perfect spot to live out that dream. Remember to provide enough seating – bean bags, ottoman cubes or even floor cushions will do the trick. Because what’s a performer without an audience! Encourage dreams of adventure on the high seas with a sailboat bed. This design has a few inspiring ideas to copy for either a bunk bed or a loft bed – I love the porthole in the flat curtain on the front – and the colours are great for a kid’s room. The basic bed is pretty simple so it’s a good option if you want something that will last for years as your kid grows up. A last thought: if you’re creating a built-in cubby bed, make sure you add a light and shelving for books and/or teddies.